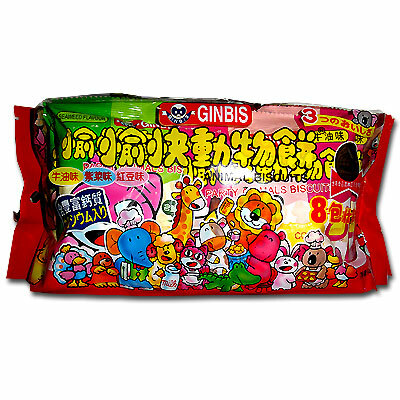 Minimum quantity for "Ginbis Party Animal Biscuits (Assorted Flavour) 8 packs" is 1. Butter Flavour: Wheat Flour,Vegetable Oil,Margarine(Milk Product),Shortening,Sesame,Skimmed MilkPowder,SAlt,Raising Agents(E503(ii),E500(ii)),Calcium Carbonate (0.5%),glucose,Yeast,Flavour and Flavouring,Colours(E160a,E150a). Seaweed Flavour: Wheat Flour, Sugar,Salt,Raising Agents(E503(ii),E500(ii)),Seaweed,Skimmed Milk Powder,Calcium Carbonate(0.5%),Margarine (Milk Product),Glucose,Yeast,Flavour andFlavouing,Colours(E150a,E160a). Red Bean Flavour: Wheat Flour,Sugar,Vegetable Oil,Red Bean Paste,Shortening,Condensed Milk,Raising Agents(E503(ii),E500(ii)),Calcium Carbonate(0.6%),Salt,Flavour and Flavouring,Colours(E150a).